Spanning an area of the South Pacific as large as Western Europe, French Polynesia includes 118 islands and atolls scattered across the blue ocean. White sand beaches (as well as pink and black) skirt rugged island peaks, while magnificent coral reefs form tranquil lagoons, dyed a startling blue and teeming with fish, eels, dolphins, rays, turtles, and sharks. The names Tahiti and Bora Bora conjure up images of private thatched bungalows built out over a lagoon, and couples silhouetted against the sunset. That said, a wide range of family-run hotels and bed and breakfasts offer less extravagant (and surprisingly affordable) experiences that take in more of the laid-back local culture. Society Islands: Explore the ocean bed and emerald lagoons brimming with life that surround Society Islands. The bustling islands feature high-end resorts, black pearl markets, and spa centers to include in your French Polynesia itinerary. Tuamotu Archipelago: The largest atoll archipelago in the world, Tuamotu offers dazzling pink and white sand beaches, coral reefs and rings, and abundant marine life. 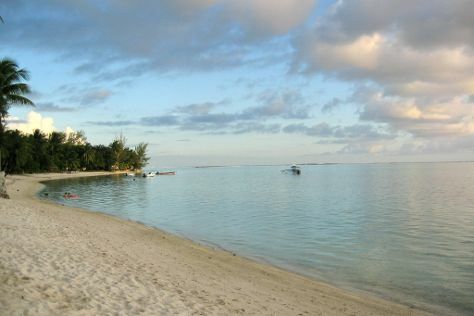 Relaxing under palms, scuba diving, and boat tours make Tuamotu a jewel of your French Polynesia vacation. Marquesas Islands: Marvels of nature like towering rocks and vertical cliffs contrast with the sapphire-blue ocean in The Marquesas, where the ancient spirits fuel local beliefs and the region’s proud culture predates European colonization. Moorea: Towering peaks that protrude from emerald valleys represent a thriving habitat for animals like bird-of-paradise. Tiki tribal villages draw visitors with their alluring culture and dancing festivals, making Moorea a tremendous boost to French Polynesia tourism. Bora Bora: Dubbed one of the most romantic islands in the world by numerous publications, Bora Bora and its colorful lagoons and lush forests offer a tranquil paradise for nature lovers. Soothing waves above coral reefs contrast with adrenaline-inducing water sports activities, making Bora Bora an all-round place for your French Polynesia holiday. Papeete: A busy port and main transportation hub for tours of French Polynesia, Papeete attracts throngs of tourists with its gaudy architecture and vivid markets selling black pearls and traditional Polynesian handicrafts. Avatoru: Venture into the uninhabited spaces that surround the border town of Avatoru--like taking a charter a boat trip to untouched islands, visiting coral lagoons, or partaking in adventurous exploration of the ocean floor on guided diving tours. Huahine: A cradle of Polynesian culture, Huahine basks in classic Polynesian atmosphere like dense jungles, hidden sacred temples, and tribal settlements. Greenery abounds everywhere,making Huahine ideal for meditating and communing with nature. Belvedere Lookout: Pack your lunch and organize a picnic with the intention of experiencing a complete panorama of Moorea and surrounding landscape from this viewpoint, where you can witness incredible sunrises and sunsets from a popular point that’s easily reachable by vehicle or on foot. Bora Bora Lagoonarium: Clear water of Bora Bora Lagoonarium reveals teeming marine life that includes sharks, stingrays, and colorful fish. Hiring a guide for a popular diving tour of the ocean floor is one of the typical things to do in French Polynesia. Tiki Village Cultural Centre: Experience the local culture during festivals where locals perform recognizable dances, host authentic traditional music, and sample Tiki food delicacies. The village supports many ceremonial buildings and wooden huts about which the locals readily tell stories and legends. Matira Beach: Rest on powdery white sand and sunbathe in the serene bay on some of the popular beaches, or venture to secluded part of the island with beaches where you can relax without crowds, with an option of aerial jet-ski sightseeing of the area. Papeete Roulottes: A dazzling mixture of colors, smells, and tastes captivate audiences from all corners of the globe in this waterfront setting, which features some of the world’s most renowned cuisines. Adding to the culinary scene of the archipelago, food trucks here provide prepared dishes just right for your French Polynesia holiday. Lagoonarium: Swim alongside the bountiful marine life of Moorea--like dolphins and sharks--with a professional guide. Here you can rent diving equipment, or bring your own, and venture underwater to explore blooming coral gardens. Aremiti Ferry: An important link between the isles of French Polynesia, this transportation service offers quick and reliable journey. Sunbathe on the deck with a snack or refreshment, and take in the scenery of passing islands. Moorea Dolphin Center: Support the cause of dolphin conservation and watch the marine animals perform tricks while guides and animal trainers professionally handle the performances that are popular with French Polynesia tourism. Eva Perles Pearl Buying: Managed by seasoned artist and creator, this gift and specialty shop focuses on jewelry that incorporates locally obtained pearls. Choose a memento or fashion detail that will remind you of your French Polynesia vacation. Le Lagon Bleu: Admire the beauty of the lagoon with clear waters and abundant palm trees, with an option of diving into the ocean teeming with marine wildlife or tasting delicious seafood in local outdoor barbecues. Kids aren’t likely to get bored on their French Polynesia holiday, as tons of open spaces, inviting marine and geological features, as well as colorful and fascinating native cultural activities attract the young ones. Let your children delve into diverse lagoons and distinctly Polynesian-styled market plazas of Society Islands. Plenty of atolls, beaches of differing sand hues, and water-based tours and activities in Tuamotu Archipelago prove to be engaging for kids, along with pristine, verdant jungle growth, rocks of awe-inspiring shapes and dimension, and the intriguing local customs of Marquesas Islands. Overall, French Polynesia acts as a giant water-themed, natural amusement park suited for all age groups. French Polynesia stands as a sun-drenched, ocean-caressed place that kids fall in love with. Soft, smooth sands and transparent waters off the coast of Matira Beach allow kids an endless supply of seabound entertainment. They’ll also be attracted to the warm, shallow lagoons of Tereia Beach, and the region’s bustling aquatic activities, like snorkeling and swimming, near Temae Beach. Ta'ahiamanu Beach, a beach oriented toward family picnics, provides an all-around attraction for the whole family. Sampling vanilla ice cream at Vallee de la Vanille, exploring the underwater coral animal kingdom Jardin de Corail, and swimming with amiable sea turtles of Turtle Conservation Center represent another handful of delightful things to do in French Polynesia that will occupy children’s free time. Maintaining your health and safety are some of the top priorities during your French Polynesia tour. Buy sunscreen in advance, as prices go way over the top here, and it’s obviously needed in such a sunny environment. Also, wear protective footwear to prevent sea urchin stings when going to the beach. Polynesians appreciate children, so food and hygiene products can be found even in very remote regions. Accommodation facilities welcome children, often providing a discount for kids (generally 50 percent of the adult rate for kids under age 12), and babies usually stay for free. French Polynesia cuisine integrates strong French influence with exotic fruits, seafood, and local vegetables with a highlight on vanilla beans, bananas, and coconut milk. Fish, pork, and chicken prepared in volcanic-rock ovens are often served on wooden plates with no additional cutlery. Poisson cru, the delicious national dish of Tahiti, incorporates raw fish and vegetables in lime juice and coconut milk, and chevrette, another notable meal, is made of freshwater shrimp. As for desserts on your French Polynesia vacation, the locals’ favorite is Poe, a sweet pudding with banana, vanilla, or papaya flavor with coconut sauce poured over the top. The Polynesian archipelago boasts numerous shopping options, from souvenir vendors to conventional retail outlets, but endemic pearls, with black or Tahiti pearls being the most prominent, are the dominant trade good. Various facilities deal with pearl production, processing, and incorporating them into jewelry (like Eva Perles Pearl Buying). Monoi, a coconut oil product used in cosmetics and traditional medicines, is available in street markets along with other distinctly Polynesian crafts like tiki carvings, embroidery, and sarongs. Among features of French Polynesia tourism are world-famous tattoos, which are deemed safe, as all islands follow strict hygiene rules. ●	More than half of the population of Polynesia is younger than 20. ●	The "B" letter doesn’t appear in the Tahitian language. Bora Bora is actually a misheard “Pora Pora,” which means “first-born,” but early colonists understood it as its name is pronounced today. ●	No poisonous snake or insects are known to live in French Polynesia. ●	"Stone fishing" survives as a traditional custom, where a group of canoes form a semicircle as men beat the water with rope-tied stones, scaring fish and driving them toward the beach. Men then yell and jump in the water, splashing on the surface and driving fish out onto the land. ●	The tattoos originated in Tahiti. The Polynesian tradition values tattoos as a sign of beauty, and men were once ceremonially tattooed when they reached adolescence. General guidelines should be followed while you enjoy a French Polynesia vacation. Bringing local fruits and vegetables into the country is illegal, since undesirable insect pests could devastate vulnerable ecosystems. Drunk driving gets you severely punished, so never drink and drive. Also, women are discouraged from staying alone on deserted beaches to prevent amoral attempts on them. Being a nation known for festivities and celebrating culture, French Polynesia highlights several holiday events. At the end of June and during the first half of July in Papeete you’ll find the Heiva i Tahiti festival, when locals participate in sports competitions, beauty contests, and feasts. A heritage of Chinese traders has remained alive, so the islands celebrate Chinese New Year, which culminates with a lantern march and parades of Chinese cultural performances. Several other festivals also exist and can spice up your French Polynesia vacation, like one of the world’s most prestigious annual surfing competitions and other sport tournaments like canoeing races. The official language of French Polynesia is French, although Tahitian and other Polynesian languages are more prominent in the communication of local people. In general, in hotels and restaurants you can hear some English, but as you move away from the urban centers, fewer people speak it. Because of that, it helps to know some useful phrases on your trip to French Polynesia. “Bonjour” means “hello,” “pardon” is “excuse me,” and “S’il vous plaît” means “please.” Tahitian will use phrases like “Ia ora na” (Hello), “Auē ho'i e” (Excuse me), and “Tapiti na pa'i” (Please say that again). Parting greetings sound like ”Au revoir” and “À tout à l'heure” in French and “Nana” and “Parahi” in Tahitian. Two words describe French Polynesian climate--warm and tropical. Although temperatures are high throughout the year, they rarely go above 35 C (95 F). Eastern trade winds cool off the area in the afternoon, creating a pleasant atmosphere for your French Polynesian holiday. The rainy season of French Polynesia lasts from December to February, after which comes the season of typhoons, but they seldom reach the islands and even then with only minor effects. Annual average maximum temperature lingers around 29 C (84 F), while average minimum temperature measures 22 C (71 F). Transportation in French Polynesia might be an issue for some--Tahiti represents the only island with public transportation, which consists of buses that hardly follow their scheduled arrival times. In general, islands have a circular paved road that follows the island coast, with track roads connecting inner land and link villages, traversed mainly by four-wheel drive vehicles. Your best option for getting around each island is to rent a car or bike. Ferry services dominate the travel between the islands, with boats equipped with a catering service that provides French Polynesian sightseeing of the islands while conducting you to your destination. Tipping on your French Polynesian vacation is neither obligatory nor expected, as it is contrary to local customs. Most of the time your money will be returned, but hosts won’t find insult in your gesture. Avoid tipping unless you find service to be really amazing, or if the facility produces a note on your bill which states that tips are welcome.